Brilliant and beautiful, peacocks are made to make an entrance. Differing from owl and bird decorations in their prowess and majesty, the peacock is a show-off – and boy, does he have a lot to show off. 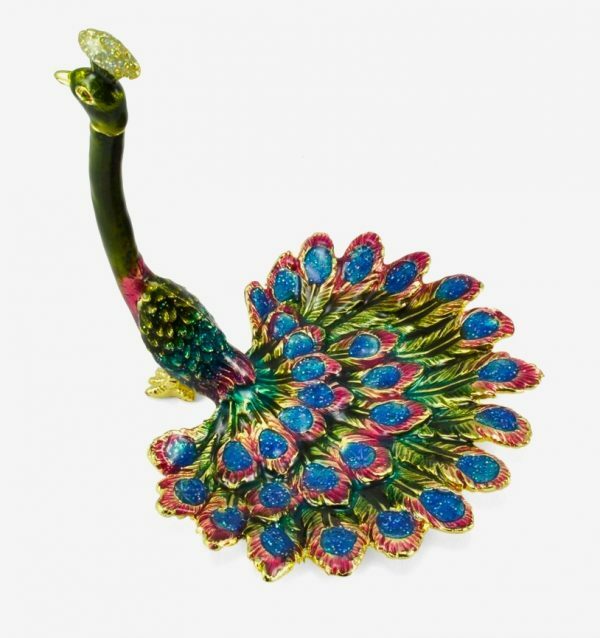 These fifty-two peacock finds make the most of the peacock's many colours and glittering tail. 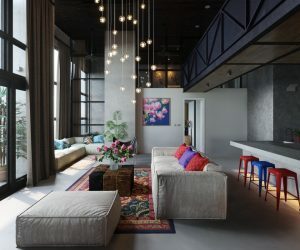 Adorning paintings, cushions, bedspreads and lighting, these pieces are designed to be admired. Place them in your bedroom to for a feeling or pride and prowess in the morning. 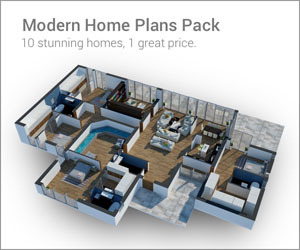 Place them in your living room to welcome guests to the ornate. 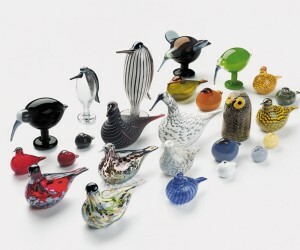 Place them in your home, to remind yourself that sometimes bold could never be more beautiful. 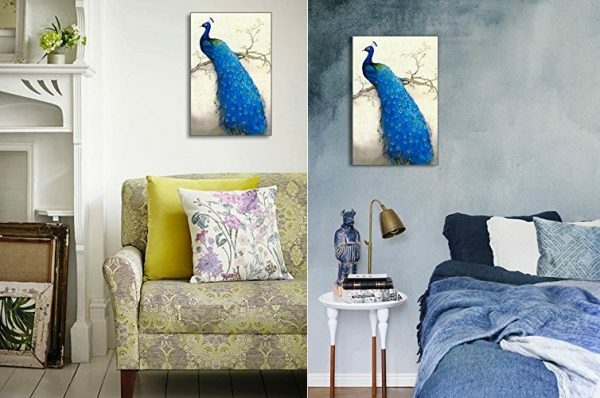 Peacock Art Print (3 Piece): Dazzle guests in your living room with this triptych peacock, a show-off with his resplendent tail. 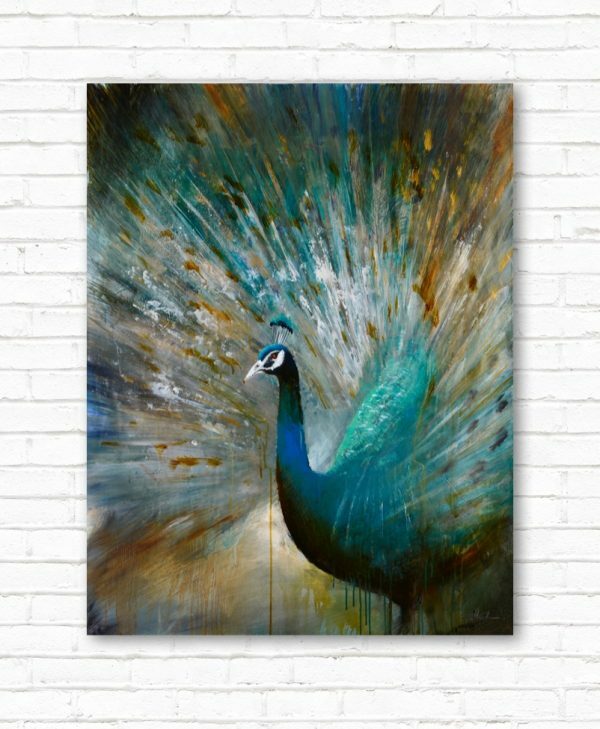 Stunning Original Peacock Painting: Adorn a white living room wall with this illustrious peacock, an artist’s original. 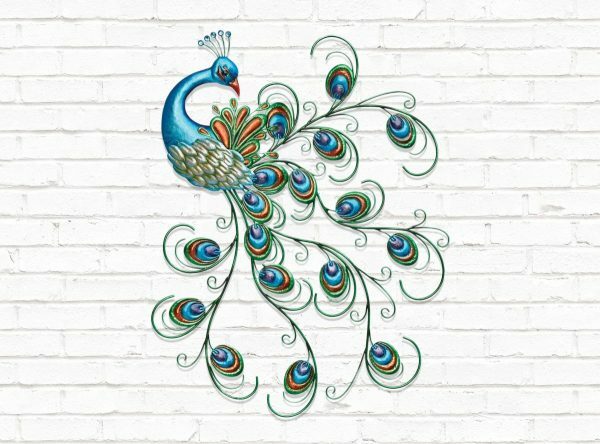 Beautiful Peacock Flourish Painting: Make the tail a masterpiece with this feather-focused painting. A treat for the bedroom, it’ll make you want to shake your tailfeather. 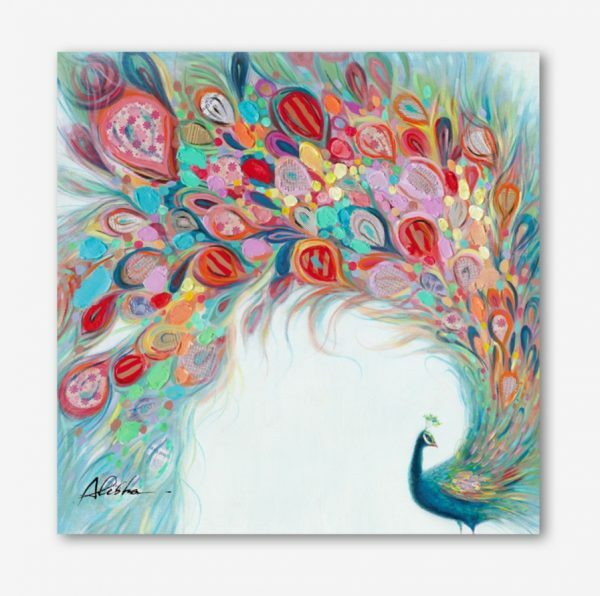 Beautiful Peacock Artwork On Canvas: A canvas backing says original art. 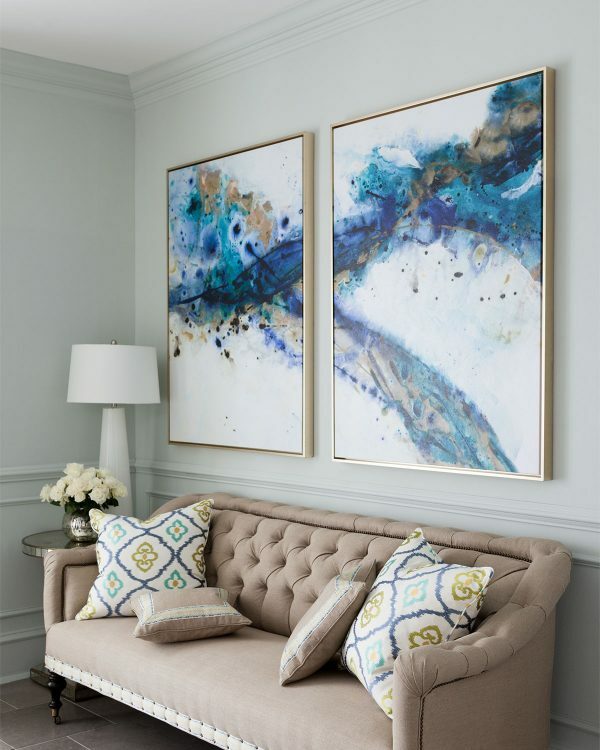 Mimic it in this blue-hued piece, perfect above a couch. Abstract Peacock Artwork: A peacock doesn’t always have to be bold. Make it diptych in this duo-framed piece, suited to a large grey or white wall. 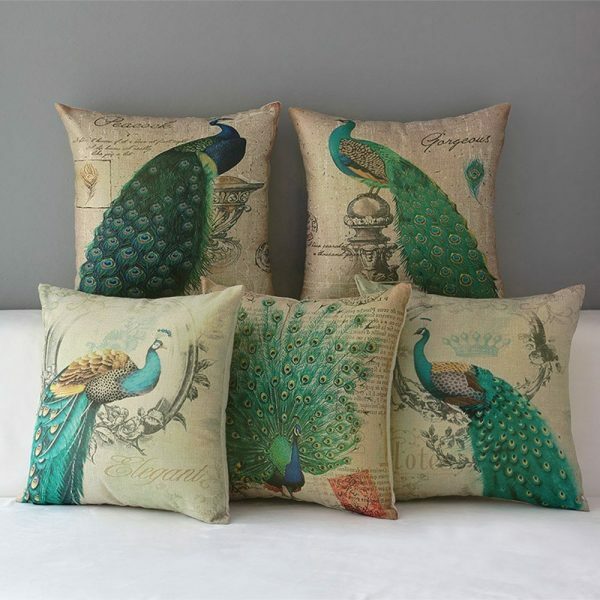 Peacock Throw Pillows & Covers: Peacocks aren’t limited to paintings. Celebrate their hues with a series of couch and bedding cushions. 5 Piece Peacock Throw Pillow Set: Need the full set? Your bedroom would revel in the flattery of these fine-feathered pillows. Peacock Rectangular Pillow Cases: Sometimes, you need a standard-shape pillow case. Make it rectangular with these unique, pop-off-the-pillow illustrations. 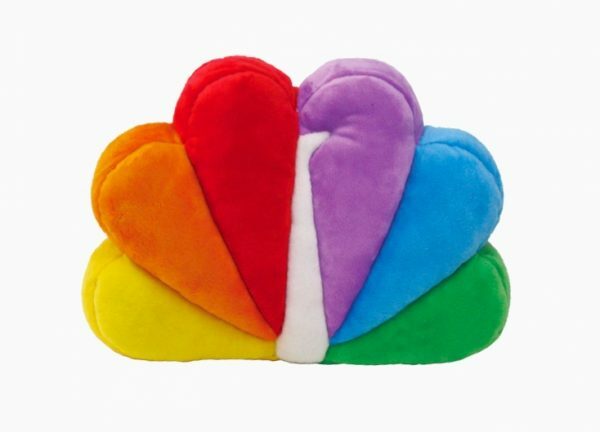 NBC Peacock Pillow: Love peacocks and TV? Combine the two with this brightly-coloured pillow for a teenager’s bed. Beautiful 4 Piece Queen Sized Peacock Bedsheets: Nothing looks better than a matching bedset. This four-piece ticks all the boxes, with a gorgeous peacock and dove amidst a posy of flowers. More Peacock-Themed Bedding: Have a girl that just loves to dress up? Cover her in peacock prints, with these loud and proud bedding sets. 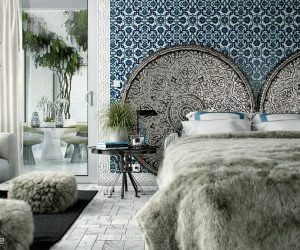 Peacock Window Curtains: Frame your bedroom view with an array of feathers. These curtains add pizzazz to any window. Peacock Bathroom Shower Curtain: 6 feet of mold, mildew and soap resistant magnificence. 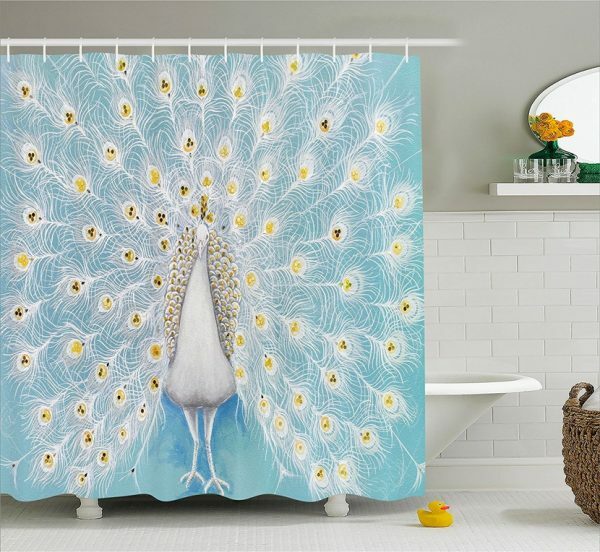 Peacock Shower Curtains: For a cheap way to share the love, consider these peacock prints for your shower. Reduce splash and increase flash for more exciting shower time. 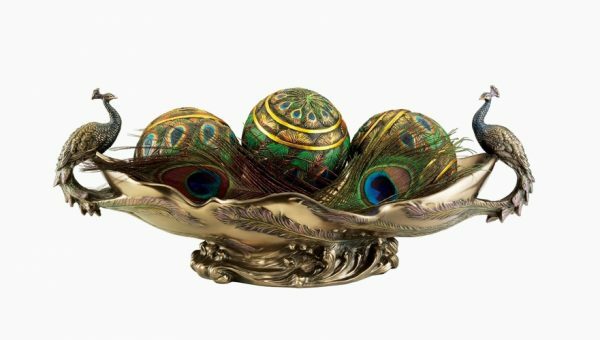 Peacock Decorative Bowl: Have a bowl of chocolates or cherries you’d like to display? This peacock brings opulence to offered treats. Peacock-Themed Decorative Bowl: A gilded table would be proud to have these bronzed peacocks as table-mates. 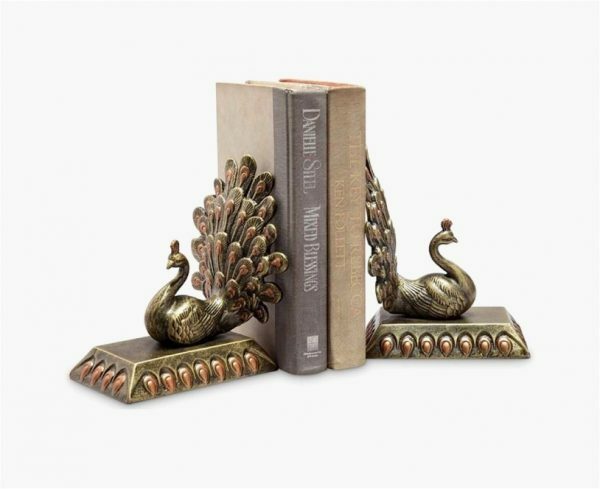 Peacock Bookends: Add drama to your library with these gilded bookends, a unique find with detailed edges. 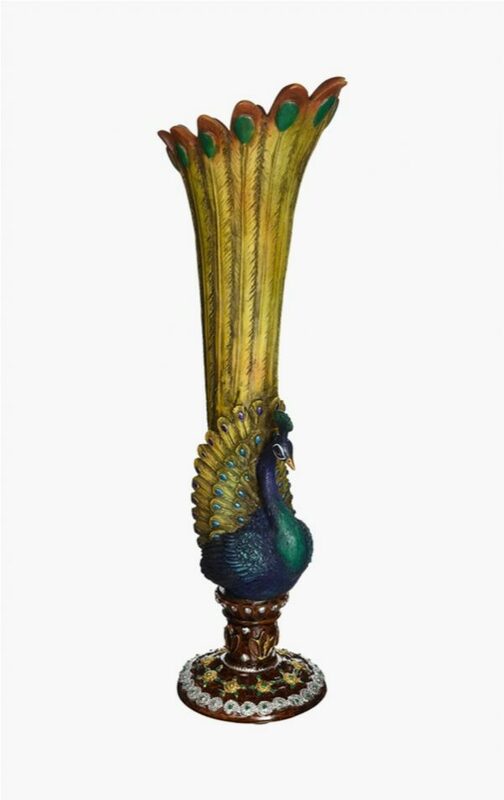 Peacock Bud Vase: This tall, elegant creature could brighten up any hallway table. 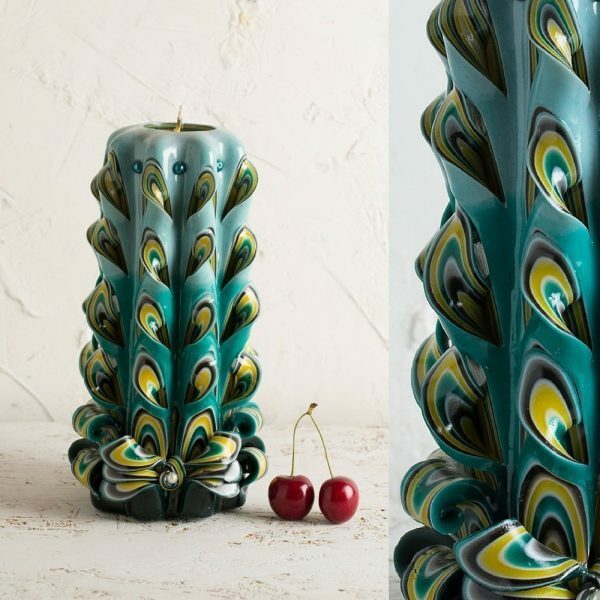 Add a sprout of peacock feathers inside, to bring this vase to the next level. 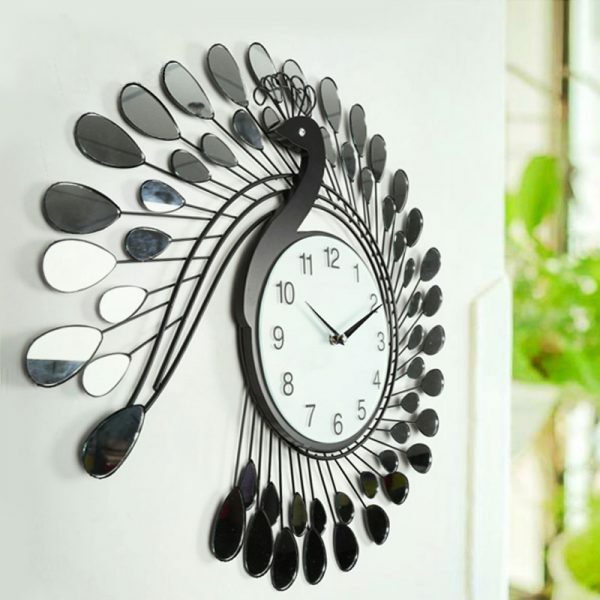 Peacock Wall Clock: Bring bold beauty to your kitchen with this monochromatic bird. Spanning his feathers right around, this is a clock face you’ll want to watch. 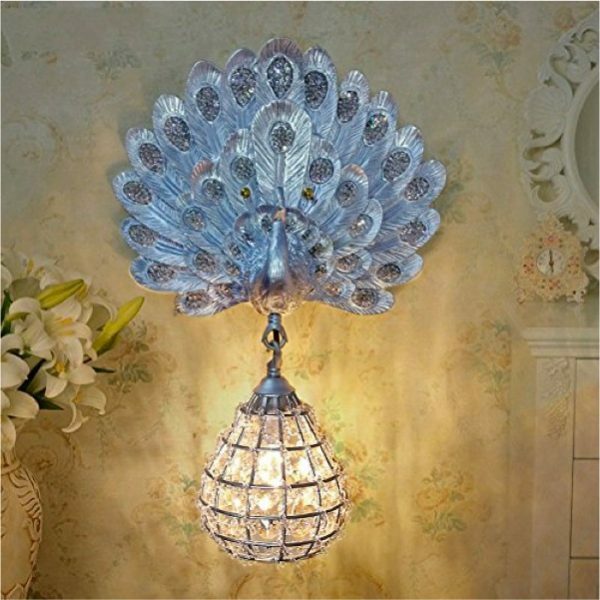 Peacock Wall Lamp: Light up your bedroom or bathroom with this unique piece, a splendour in silver. An elegant teardrop holds the light. Peacock Glass-Topped Pedestal Table: Bring India to your living room with this glass-and-peacock creation, bathed in striking green, red and blue. 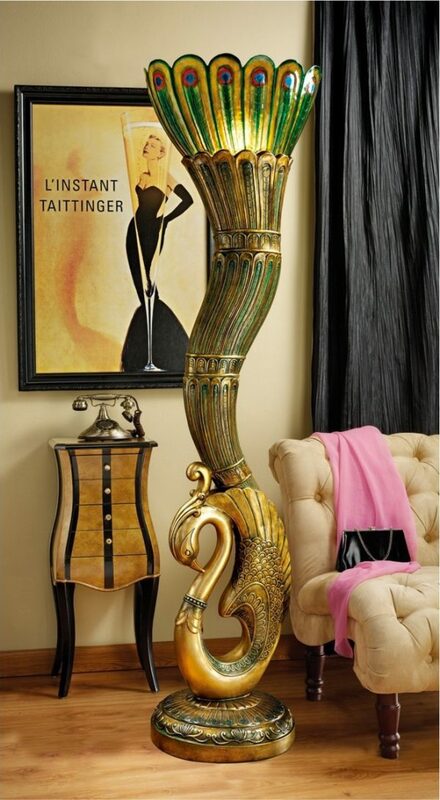 Art Deco Style Peacock Sculptural Floor Lamp: Add interest to your living room, with this floor-length lamp for the art-deco interior. Watch its body glow amber beside the couch. 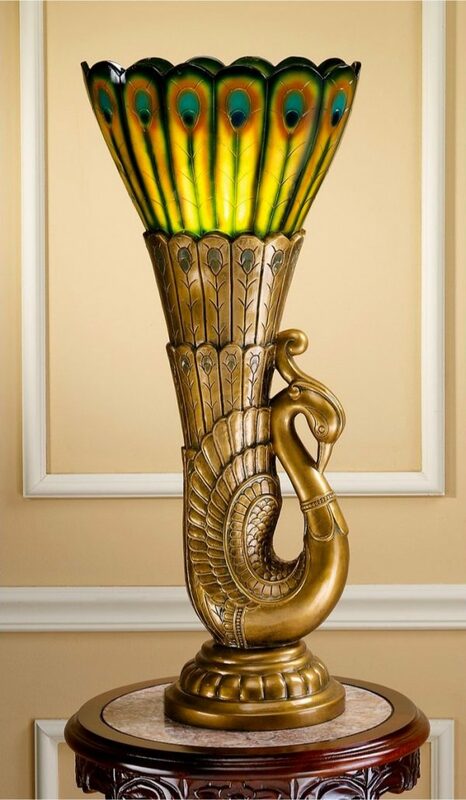 Art Deco Style Peacock Sculptural Desk Lamp: Want the glory, without the size? This desk-bound creation is sure to light up your office. 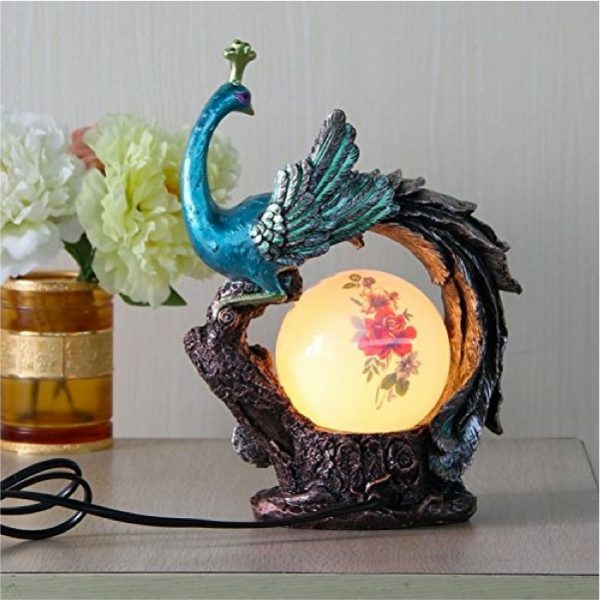 Novel Peacock Light: Have a little one that loves the animals? Cradle them to sleep with this artistic bedside table lamp. 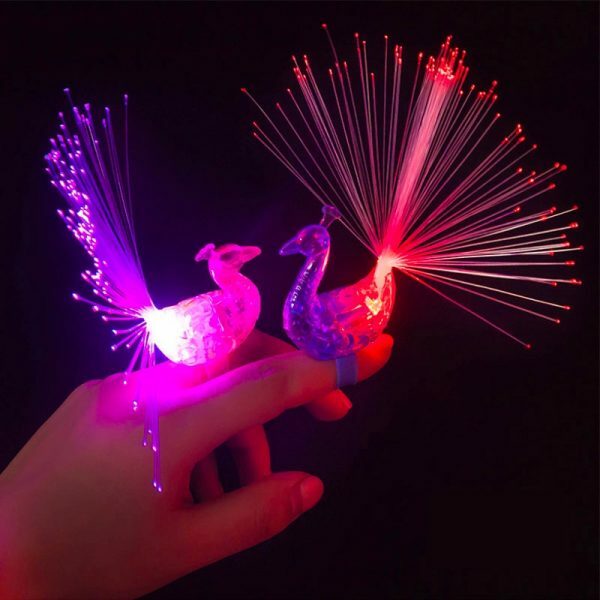 Peacock LED Night Lights: Make sleeptime interactive, with these LED finger peacocks. Nestle them on your young one once in the land of nod. 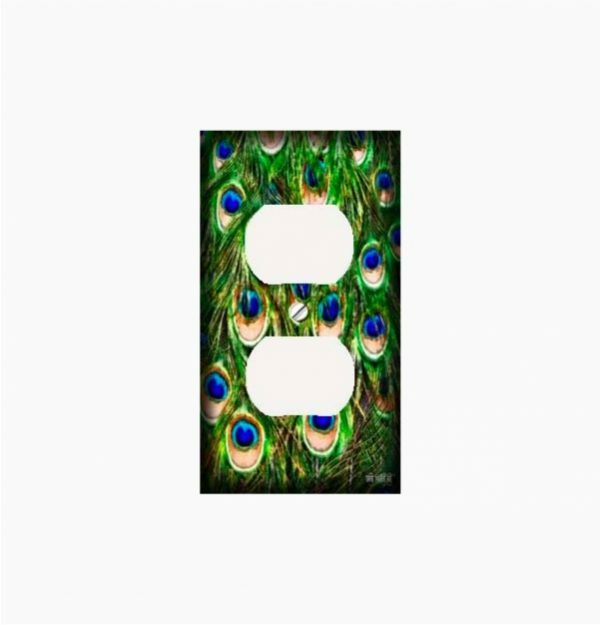 Peacock Themed Power Outlet Cover: Bored of standard light switches? Make them pretty with a peacock cover. Unscented Peacock Pillar Candle: Want something snazzy for your Christmas table? 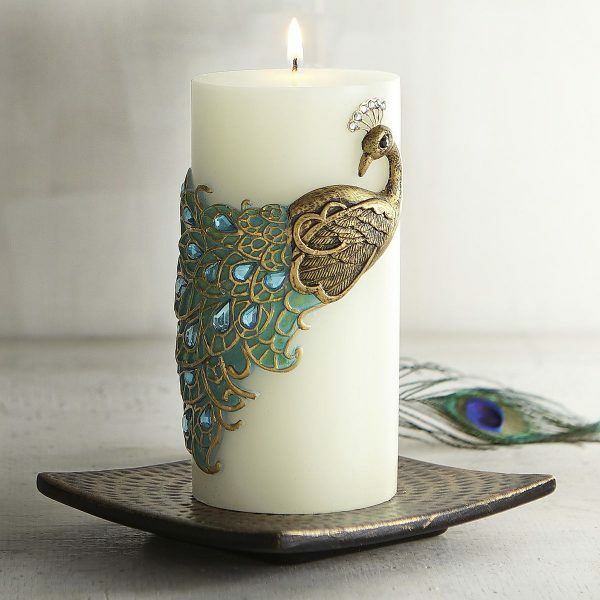 Invite the peacock with this pillar candle, a unique and romantic find. Carved Peacock Feather Themed Candle: Bring out the big guns with these tail-inspired decorative candles, perfect for the hard-to-buy-for friend. 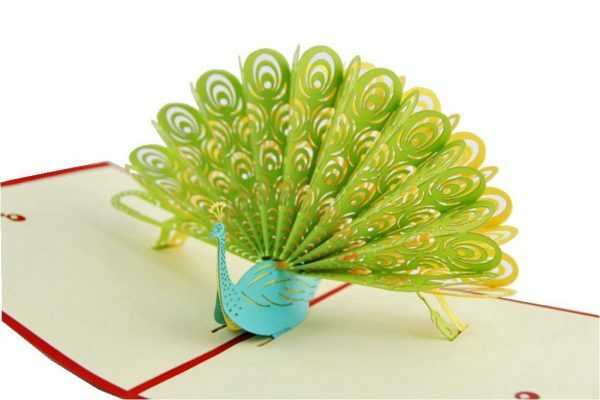 Peacock Pop Up Greeting Card: Cute as a card or desk feature, this green-and-blue creature holds sway over two blank pages. 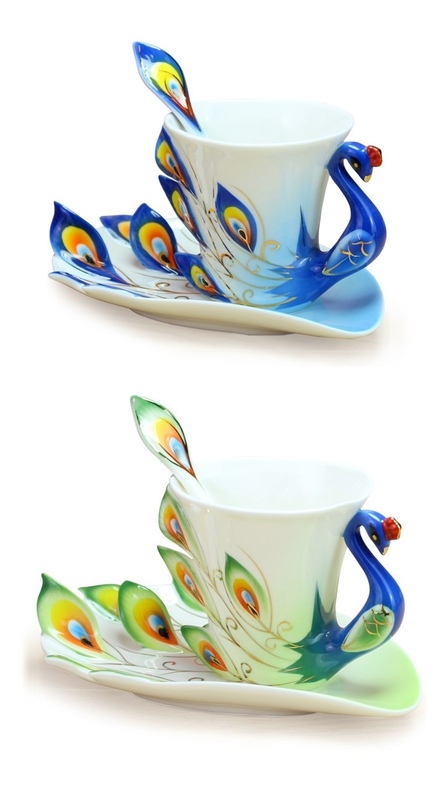 Peacock Cups: Add flair to your morning coffee with these elaborate cups, complete with detailed saucer. 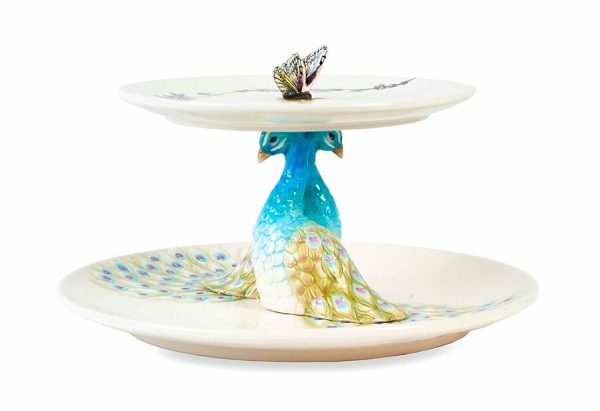 Peacock 2-Tiered Server: Bring a peacock to tea with this two-tiered cake stand, great for cupcakes and pastries. A butterfly joins the party as a pretty piece on top. 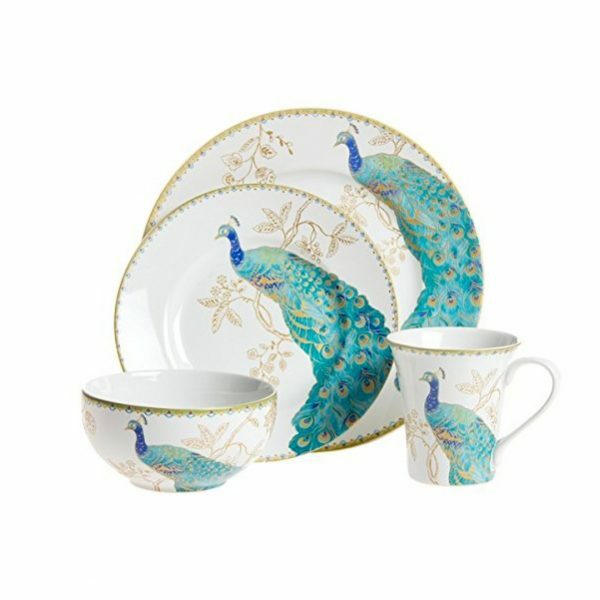 Peacock-Themed 16-Piece Dinnerware Set: Want the whole bird? Eat with peacocks everyday with this bronze and turquoise dinner set. 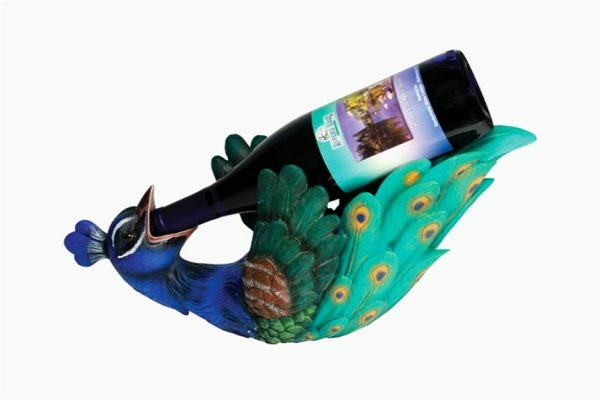 Peacock Single Wine Bottle Holder: Ever see a peacock drinking? Fascinate your guests with this quirky wine holder for the dinner table. 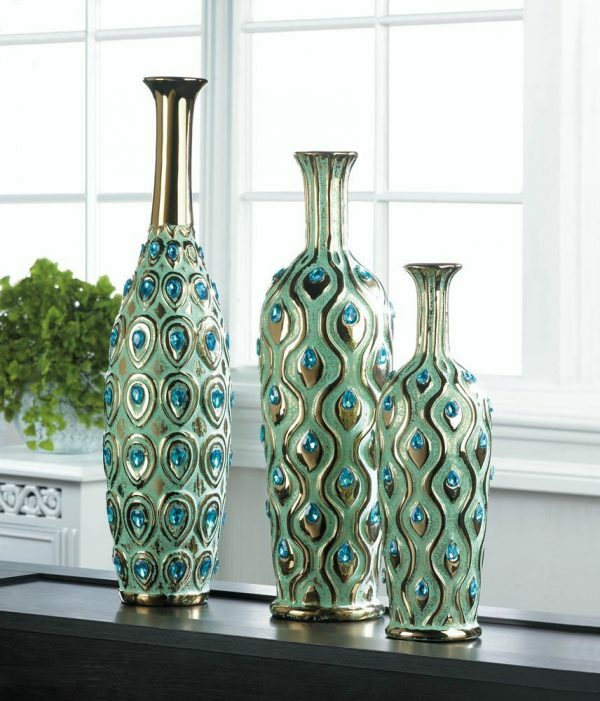 Peacock Themed Vases: Reveal peacock undertones with these themed vases, a match for seaside or silver-hued interiors. 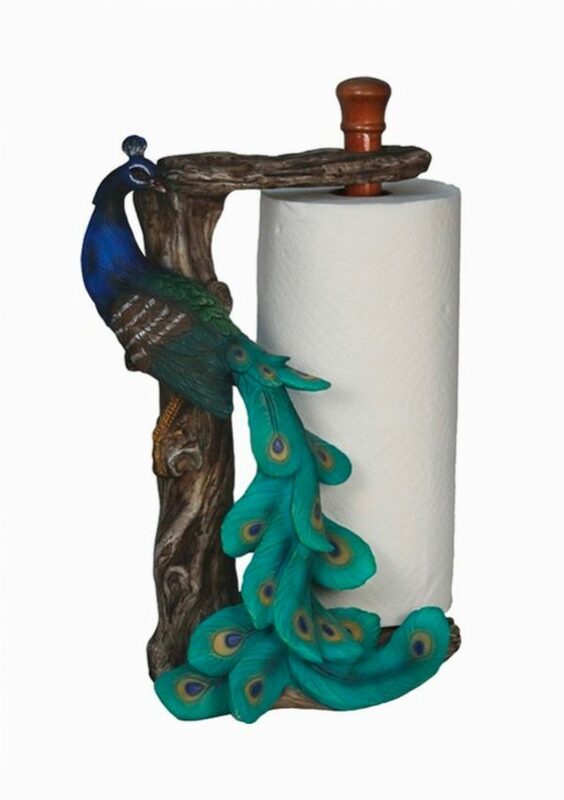 Peacock Paper Towel Holder: Add wow to kitchen basics with this sculpted holder. 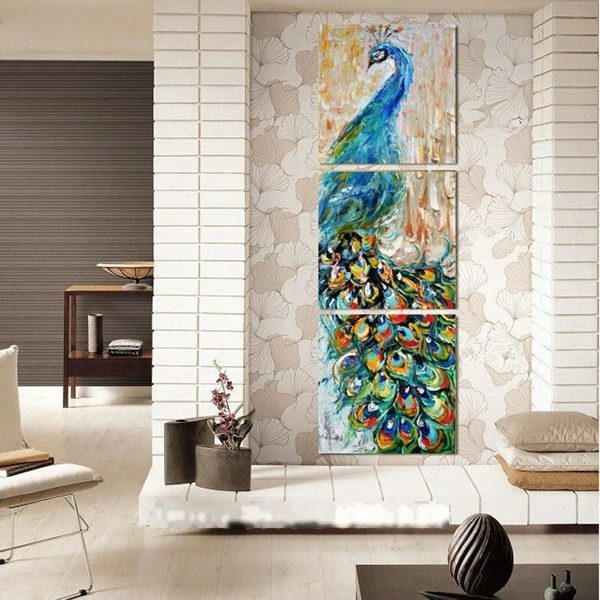 Peacock Wall Decor: Add flair to your bathroom or bedroom with this wall piece, resplendent in turquoise, orange and metal detail. 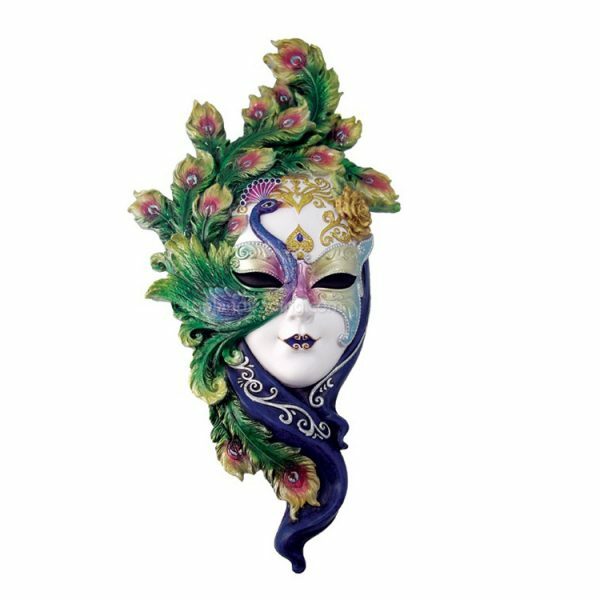 Lady Peacock Venetian Style Carnival Mask: Love the theatre? This dramatic mask could be the focal feature of your study. 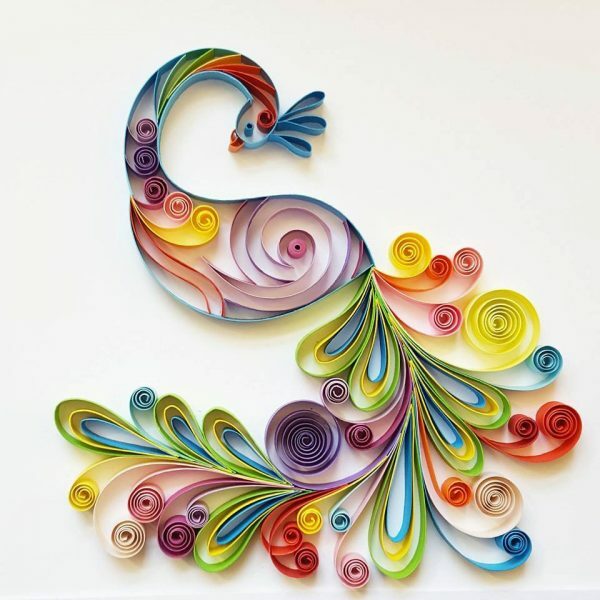 Quilled Peacock Paper Wall Art: Origami isn’t the only paper art form. 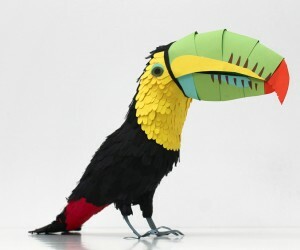 Engage in a spot of quilling with this eccentric paper piece for the home office. 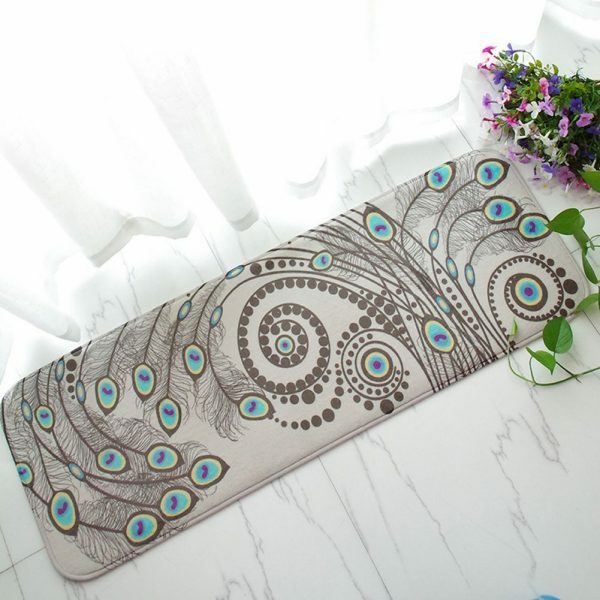 Stella Peacock Themed Rug: Want only a hint of the tail? 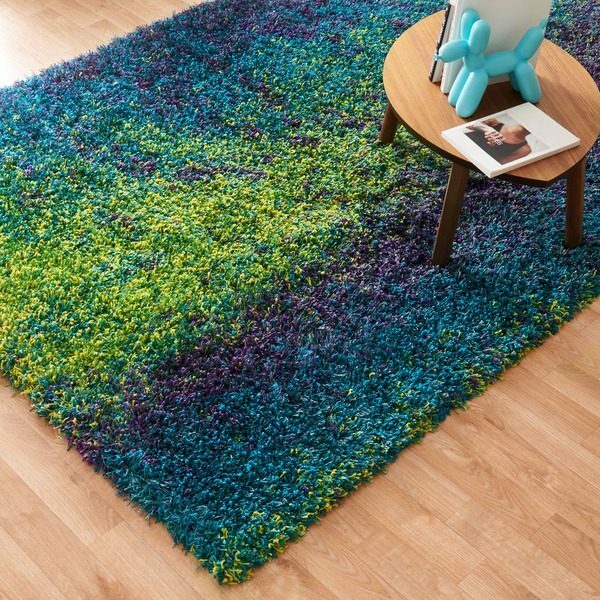 Steal its colouring with this multi-hued shagpile rug. Peacock Doormat: Not used to being a doormat? Celebrate your louder side with this dramatic peacock find. 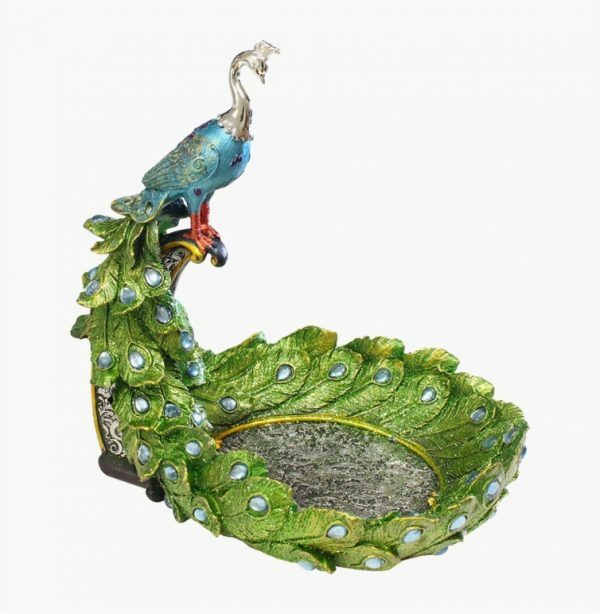 Peacock Jewellery Holder: Want a jewellery holder as ornate as its object? This peacock piece hits all the right notes. 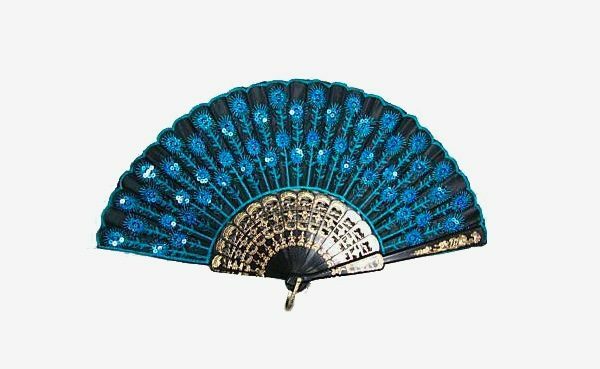 Peacock Themed Lady’s Silk Hand Fan: Titivate the fancy-dress box with this silk peacock fan, a must for the lady of style. 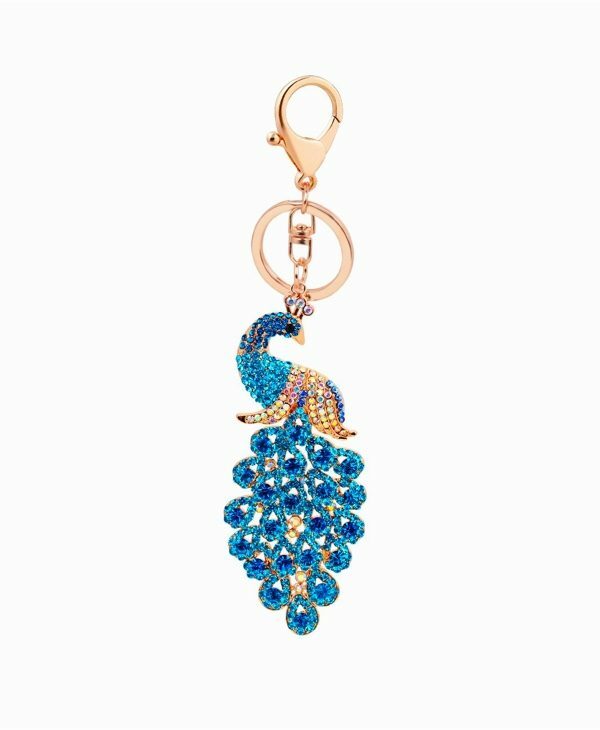 Peacock Keychain: Make your keys glitter with this jewelled turquoise design, the envy of friends and family. 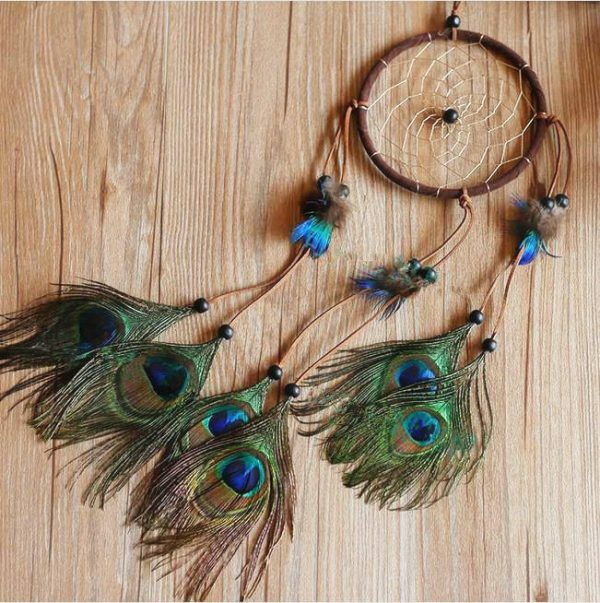 Peacock-Themed Dreamcatcher: Feathers look beautiful floating in the wind. Hang them at your entrance with this simple dreamcatcher. 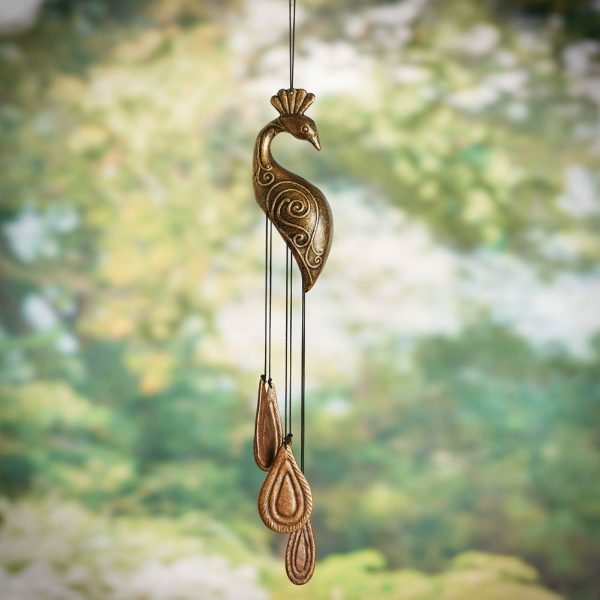 Aluminum Peacock Wind Chime with Gold Inlays: Inlaid with gold, this four-piece chime invites guests with one peaceful sound. 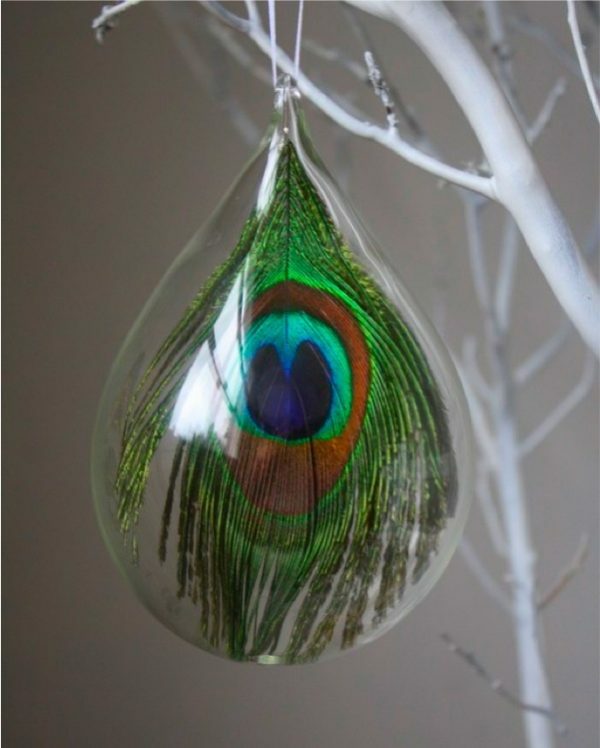 Hand Blown Peacock Glass Ornament: Hang something different on the Christmas tree with this glass-blown beauty. 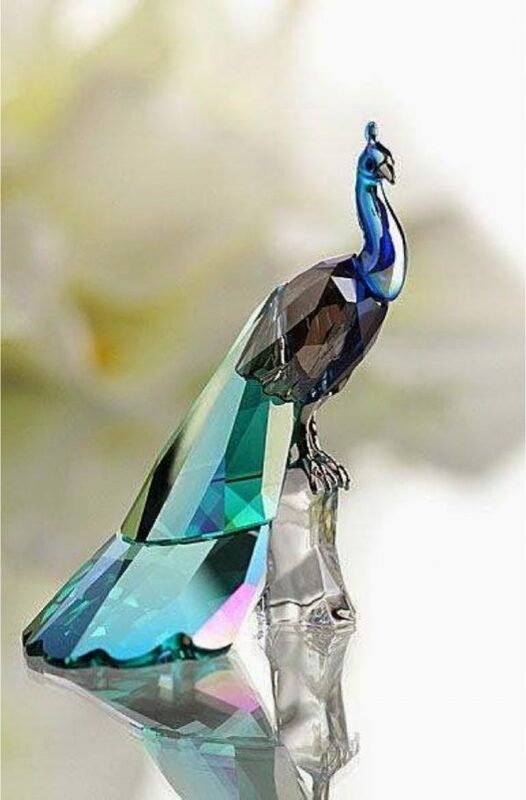 Swarovski Crystal Peacock: Crystallise one of the world’s most beautiful birds with this stunning Swarovski ornament, a feature for the bookcase or cabinet. 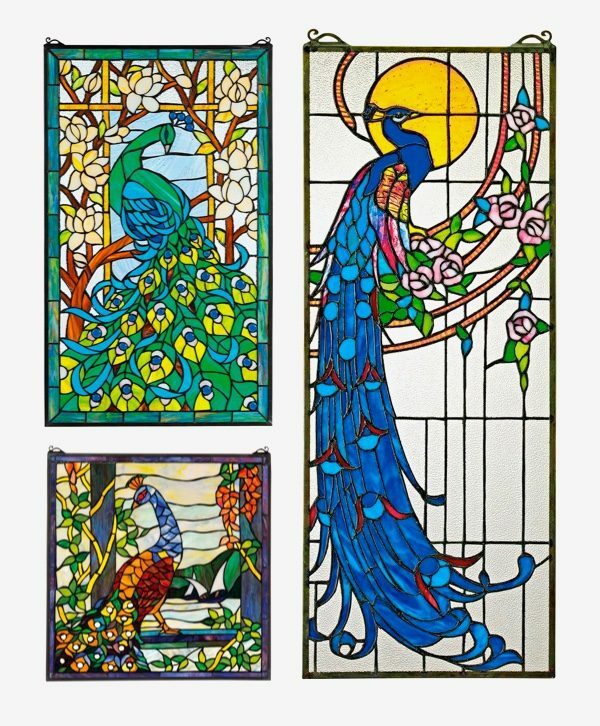 Peacock-Themed Stained Glass Windows: Almost religious about peacocks? Hang them in your bathroom with these gorgeous stained-glass effects. 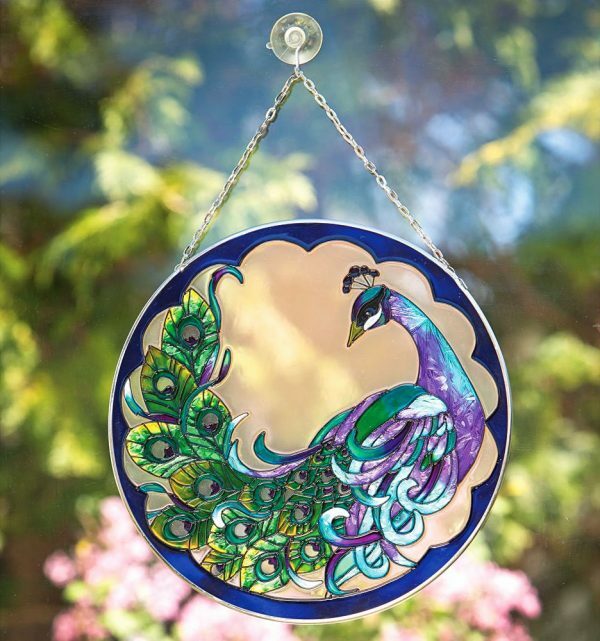 Peacock Art Glass Sun Catcher: Take the peacock in miniature with this ornate sun-catcher, a fitting feature for a girl’s bedroom. 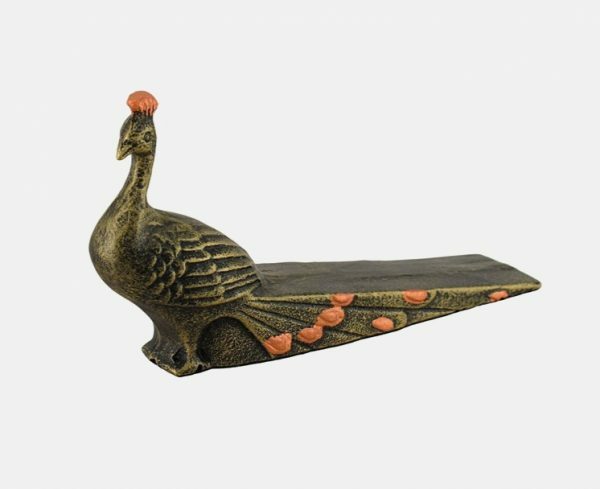 Peacock Door Stop: Stop traffic and the door with this dramatically different door stop. 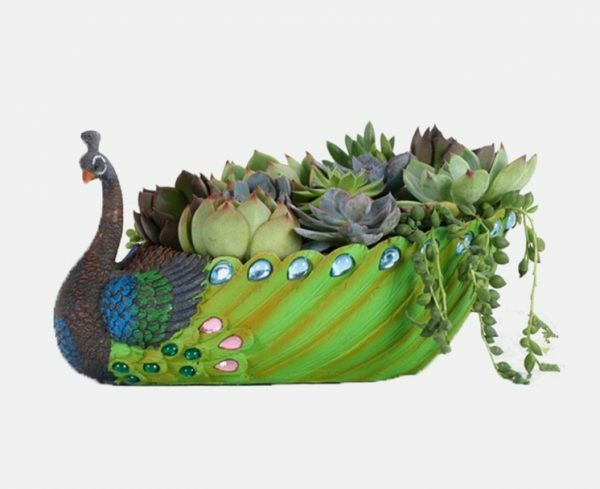 Peacock Planter: Adorn your kitchen ledge with this unique planter, a sunny spot for small succulents. 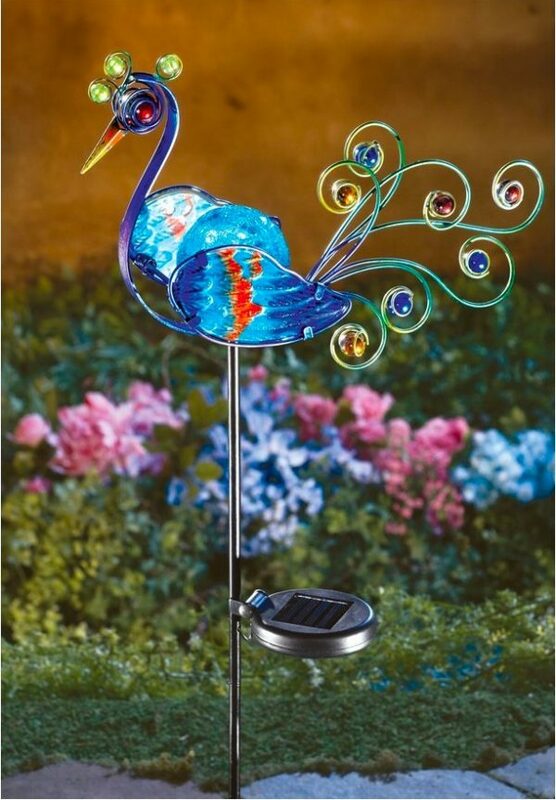 Solar Lighted Peacock Decorative Garden Stake: Bring the power of the peacock to your flower bed, with this metal-and-glass sun-lit stake. 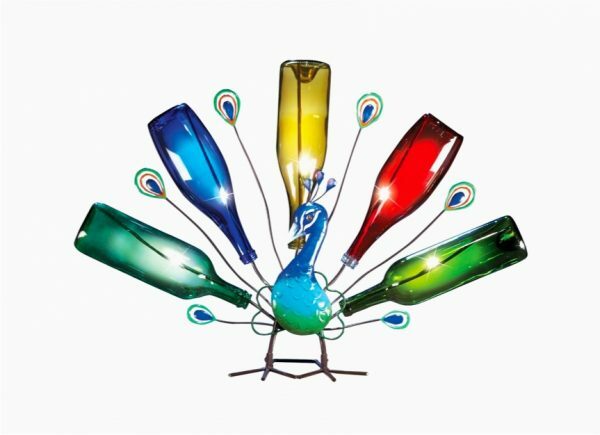 Solar Garden Peacock Wine Bottle Tree: Show off all your best reserves with this multicolour holder, in a range of bright colours.